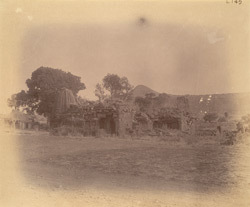 Photograph of a group of six ruined temples near the village of Anjaneri, Nasik District taken by Henry Cousens either in the 1880s or the 1890s. Anjaneri is situated in northern Maharashtra. A large number of temples were built here independently of one another, unusual for temples of such a small size. They are not clustered around a central shrine in the manner that most small Indian temples are, instead each stands alone and is dedicated to a different deity. The Brahmanical shrines have been damaged very badly and probably on purpose whilst the Jain shrines have been better preserved. This photograph show a number of different shrines, most probably dedicated to both Jain and Brahmanical deities. The shrines face in different compass directions and the deliberate damage to many can be seen in this photograph particularly affecting the Shikara or tower.